PACSA welcomes Dr. Ali Kiafar on October 28th at the University of Southern California for a lecture titled “Society, City Planning and Urban Design in Modern Iran.” Dr. Kiafar has a Master of Architecture and City Planning degree as well as a doctorate degree in Urban and Regional Planning from USC. He has received several awards and recognitions including Community Development Award from the American Institute of Architects as well an Excellence in Teaching Award from the University of California-Riverside. 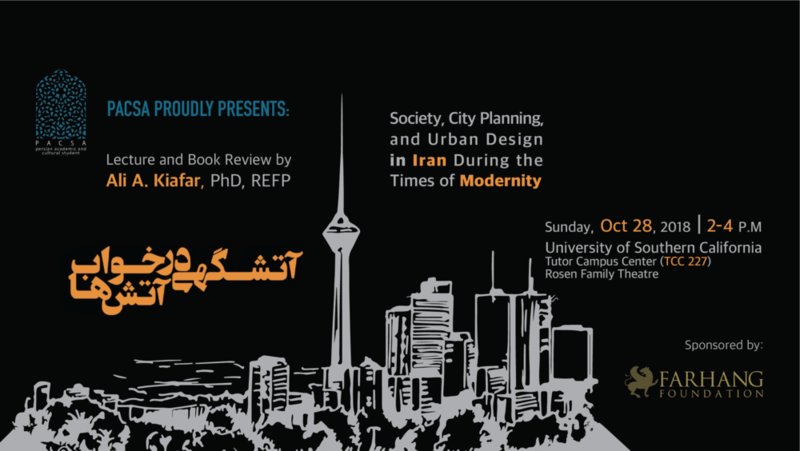 Please join us on Sunday, October 28th from 2PM-4PM at the Tutor Campus Center (TCC) in room 227 to hear Dr. Kiafar speak about his recent book on Iranian architecture followed by a book signing at the end of the lecture. All profits from this book will be donated to underprivileged children in Sistan & Baluchestan provinces in Iran. We hope to see you all there!